Abbiamo pernottato una sola notte al Calafont nel corso del nostro rapidissimo viaggio in Irlanda. Il B&B è molto confortevole, le stanze sono grandi e pulite, molto luminose e offrono una bella vista. La proprietaria, Mary, è una persona squisita e molto cordiale, e ci ha permesso di fare il check-in nella tarda serata. La colazione è abbondante, e nello stile tipico irlandese. Al momento della prenotazione, che abbiamo effettuato solo pochi giorni prima del nostro arrivo, avevamo chiesto a Mary se ci potesse trovare un posto sul landing tour per Skellig Michael, e lei riuscì nell'impresa! Peccato che nel nostro unico giorno di permanenza il forte vento non permettesse l'attracco ma solo un'eco tour: non l'avessimo mai fatto... siamo tornati dal tour completamente fradici e infreddoliti! sappiate quindi che è bene non fare il tour a meno che non ci sia calma piatta e totale assenza di vento, altrimenti le onde sono davvero alte e il tour diventa un'agonia! Non sapendo dove andare in quelle condizioni abbiamo pensato di tornare da Mary che è stata di una gentilezza veramente unica: nonostante avessimo già fatto il check-out ci ha accolto permettendoci di usare il bagno, di farci una doccia e di cambiarci i vestiti, offrendoci dopo anche una tazza di té caldo, senza volere nessun compenso... insomma, un vero angelo! consigliamo caldamente il suo B&B! Great,Wonderful. Ms Mary the hostess with the most greatest personality. The house was so clean and no clutter or dust collectors.Ps just the way i like it. We traveled through Ireland for 10 days but our stay at Calafont was our favorite. The breakfast was really great especially the fruit salad. Mary even helped us book a tour around the Skelligs and and gave us helpful tipps. We can only recommend staying with her! Very nice and quite place, not far from Portagee harbour, good place for excursion to Valentia Island, Ballynskellig Ring and above all the trip to Skellig St Michael Star Wars - episode VII -VIII Friendly owner, good breakfast! Lovely place to stay with a very gracious host. One of the best accomodations of our holidays! The room was spacious, the bathroom looked newly renovated, breakfast was delicious and everything was very tidy. And our landlady gave us tips for the day - perfect! Excellent séjour à Calafont B&B. Lovely B and B with beautiful views of the harbor. Mary, the hostess is a very friendly and helpful lady. She gave us a delicious Irish breakfast in the morning and lit a peat fire in the dining room for us while we ate! I wish we had more time to chat with her. The room was very large and comfortable. There were several power strips around the room which was very helpful and not provided at other B and Bs that we stayed at. I would definitely recommend Calafont B and B. Great place to stay. Fantastic views and an even better breakfast. A very comfortable B&B with splendid views across to the Island. Mary made us feel very at home, and helped with our meal and trip bookings. We had a wonderful time of 4 days in the B&B house Calafont. Mary is a very friendly host and the breakfast was perfect. We will come back next year. Had very pleasant stay here on our way round the ring of Kerry, the room was very nice the host very friendly, the breakfast was lovely and so was the views from the dining room sadly the internet was out of use on our visit but was informed it was soon to be fixed , apart from that we did miss the tea tray but was given a nice cup of tea when we arrived . Thank you again for a nice stay . We had a lovely stay at Calafont B&B on our trip around the Ring of Kerry and the whole island of Ireland. We arrived late in the evening and had slight problems to find the place because the coordinates put us to a slightly different place. After asking from locals we found the place along the Skellig Ring road. The madam of the house was very kind and sweet. She asked what we want for breakfast and it was perfect in the morning with Irish tea cups and stunning view from the window. The bed was comfortable and everyone had their own private bathrooms which was just renewed. We didn't know that the payment has to be paid in cash and so we had to go tho the local market to get cash in the morning. After all we had the best stay here during our week in Ireland if the price and quality is compared. Big thanks to the the madam! 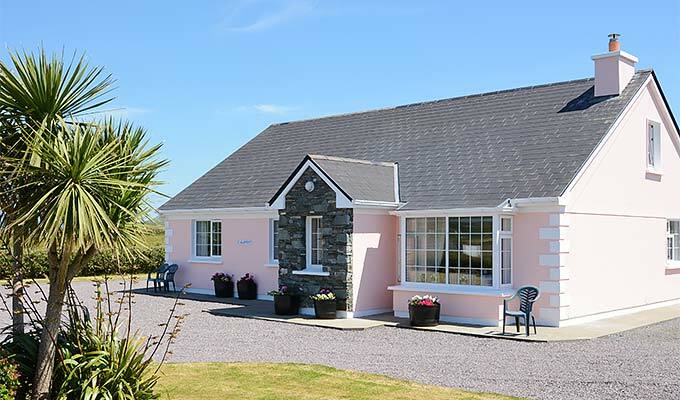 Very nice accommodations and easy to to access to docks to Skellig Michael. The website we booked it through didn't have accurate GPS coordinates or the phone number of hostess so had to ask in town where the B&B was located. We booked a twin room and were totally satisfied. Mary Cartin could not be more helpful. We left our bikes and baggage there for the day while we visited Skellig Rock a wonderful place. I would recommend Calafont to anyone. We had a lovely one night stay. Mary was very kind and very keen to tell us all about the many attractions nearby. Room was immaculate. A short cycle ride up a hill out of the village. Our breakfast room view was stunning. The calafont was a perfectly good place to stay with no thrills or spills. However, on booking the was no mention that credit cards were not an acceptable form of payment. I was also asked to pay the full payment despite paying an online deposit. Mary's home has a beautiful view of the Portmagee Channel and Valentia Island. It is in a quiet setting, but close to town. We enjoyed talking to Mary and learning more about the area. She booked us on a boat to the Skelling Islands. It was one of the highlights of our trip. I had a great experience at the Calafont B&B. The suite in which we stayed was pristine and comfortable. The breakfast was quite delicious and Mary, the B&B owner, was very helpful and friendly, yet let us have our privacy just enough. I highly recommend. I could add that, if you're looking into going to Skellig Michael, I would reserve at least three days. It generally happens that the weather doesn't help much and you might need a window of days for the weather to be good enough for boats to go over. It is worth it. On days that you are not going over, you can be driving from there and stopping at the many beautiful sites along the Ring of Kerry. Very nice, friendly, helpful, clean. 2 minutes drive from the little harbour w. trips to skellig islands. Terrific view. Mary is a great host!! She is so friendly and helped me book a trip to Skellig Island, which was incredible! The room was comfortable and breakfast delicious! I really enjoyed talking with Mary and I look forward to staying with her again the next time I'm in Portmagee. We had a great time in this small little town. Our host was very eager to help us and her home was neat and quiet. It was our first of 8 b&b's in Ireland and it was one of our favorites. Though we already had reservations to go to Skellig Michael Island she called and double checked that we were still on the list. She had recommedations for food, entertainment, hiking and biking and the Kerry Cliffs were close enough that a person could have walked there. Wir waren das zweite Jahr in Folge im B&B Calafont in Portmagee, weil die Chefin einfach nett und absolut zuvorkommend ist. Die Unterkunft ist gut, das Frühstück ebenso. Preis-Leistungs-Verhältnis stimmt. It was a wonderful B&B and wonderful Holidays. Portmagee is the best place in the world. The B&B was very tidy and the breakfast good. Thank you very much, you were great!! Mary was most helpful. She booked a boat trip for us to Skellig 'Michael. Used her line for our washing. Mary was simply delightful! She was wonderfully kind to my little children and made our whole family feel right at home. We couldn't have asked for a more welcoming and warm night on the beautiful Ring of Kerry! It was a very welcoming by Mary at the Calafont B&B. The rooms are comfortable and clean. The position from the Calafont is opposite at a unique landscape. The Irish-Breakfast is fondly prepared, fresh and very delicious. Mary, thank you very much for the excellent stay at your B&B! Everything was perfect. Mary is a perfect hostess. The room was beautiful, very clean, comfortable and with a wonderful view. The house is lovely and in a beautiful position. The breakfast was very nice and diversified. Très bon accueil. Très bon petit déjeuner irlandais. Vue superbe. Accueil chaleureux, bon confort, hôtesse très sympa. Excellent hospitality, accommodation and food also excellent. Mary very helpful with local information. Just a little further out than we expected. Staying at Calafont was excellent, you have a great view from your bedroom window as well as from the breakfast room of Valentia Island and other spectacular views just around the corner. There is a warm and welcoming atmosphere at this B&B, especially thanks to Mary, your host. She`s always ready to give you tipps and there to hold a conversation with. Breakfast is delicious and the coffee is good and strong. I have already been there several times and I am definitely going to come back! Very cpmfortable friendly service and Mary was so welcoming. Portmagee and nearby Valentia island lovely to visit and a good buzz in the pubs and restaurants. Also we got the boat to Skellig Rock from here. We thought that the breakfast was a little early but were glad in the long run to get more out of the day - so much to visit here. Calafont B&B is just the best place you can stay over. You feel there like at home; the host Mary is really nice and gives tips about places to see and where to go. She can also book a boat trip to Skelligs for you. Our room was really specious, nice and clean with a big and clean bathroom. The breakfast was very tasty and Mary cared we had everything we needed. We had a great time there and this is the place you can really relax and enjoy quiet and peace. Ideal location, beautiful views and amazing service! I highly recommend it! Polecam to B&B, to naprawde wspaniale miejsce. Pokoje sa duze, czyste, z czysta i przestronna lazienka. Gospodarz Mary dba, by nikomu nic nie brakowalo, jest bardzo mila i pomocna. Podpowie gdzie sie wybrac, co warto zwiedzic i gdzie pojechac. Moze rowniez na zyczenie zabukowac podroz lodka na Skelligs. Sniadania bardzo smaczne, mozna wybrac Full Irish lub kontynentalne, rozniez gdy sie o cos poprosi to nie ma problemu. Lokalizacja B&B jest po prostu super! blisko do centrum Portmagee 10 min piechota, piekne widoki dookola, cisza i spokoj. Mozna naprawde wypoczac i sie zrelaksowac. dobry punkt wypadowy na podroz Ring of Kerry, na Valentia Island itd. Goraco polecam, bo czulismy sie tam bardzo dobrze, prawie jak w domu. A rowniez i cena bardzo przyjazna.